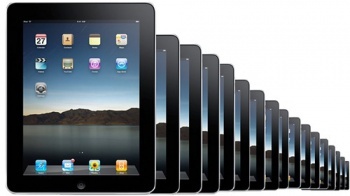 Sources say the next tablet model from Apple will drop March 2012. If there's one thing we've learn in the last decade or so of new models rendering fancy gadgets obsolete, Apple will not rest on the laurels of one piece of hardware. The tablet revolution starting iPad is no different, as sources close to the development hint a new model is coming soon. The new iPad 3 will be a more substantial update than the iPad 2 was, with a beefy quad-core CPU to better handle switching between applications. The new iPad will also be equipped to handle new wireless standard "LTE" that will be rolling out from Verizon and AT&T. Sources say China manufacturing plants run by Foxconn Technology Group have been ramping up production on the new product and we'll most likely see the iPad 3 in Apple stores this March. The sources who spilled the beans were reticent in releasing too many details on the new tablet, but one did mention a better screen resolution. The pixels of the the iPad 3 are small enough that images appear like printed material, one source said. Videos should also take a lot less time to buffer and start playing because of the added processing power. The graphics processing power will also make games that have intense graphics run much smoother, and may signal more 3D remakes or ports of older games like Grand Theft Auto 3 on the App Store. There's no word on what colors the iPad 3 will come in. Me, personally, I want Apple to start shipping electronics in lame pastel colors again like the iMac in the 90s. I mean, come on, who wouldn't want a purple iPad for Easter this year? That would totally make the iPad 3 sell more units than the 1 million sold the first two days the iPad 2 was out.